Just wanted to say thank you again for the check. Your kindness is truly appreciated. I hope you have a nice Easter. Wanted to let you know, thank you for your words the other day regarding my daughter. Thank you for the thoughts and prayers. Thank you Boris and Ines for your fantastic hospitality in Nashville! 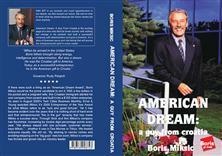 Boris, I always leave you with learnings and inspiration. I will update you on developments. All the best! Just thought you would like to know that I am fully retiring this week after being at work for 50 + years of which 22 have been working with Cortec. 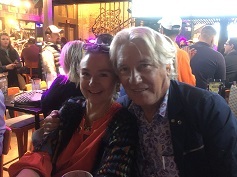 I would like to thank you personally for the friendship and support you have given me over the last 22 years it has been a great pleasure and joy working with you and knowing you. It has been especially nice to have consider myself as your friend and to have known you Mother and Father and to have felt a part of the Cortec family where I have always felt very welcome. I am sure I will miss now not being involved in the world of VpCI corrosion inhibitors but it is now time to hang up my boots. I wish you and Innis all the best for the future for how long you decide to carry on working. I just wanted to reach out to say thank you for everything you have done for me. You have provided great leadership and inspiration over the years and I have no doubt in my mind, we have made Cortec a safer place to work! Back in 2008, we faced some hard times in the economic downturn and I remember you saying that "I have weathered many storms over the years and this time is no different." You are the smartest guy I know and you make the tough decisions for everyone else. I know you will navigate this storm as well! I have benefited greatly as your Safety Manager and I have learned so much over last 5 years. I'm hoping to pass on the knowledge to others in the future. In the meantime if you need anything at all please let me know. It's been a great experience overall and I wish you and Ines all the best!! I’m hoping you are both well, enjoying the holidays and looking forward to a GREAT 2019! Another successful year at Cortec behind us with many more to come. I was glad to see you both at CHQ, but glad to know you are enjoying sunny FL. My family and I thank you so much for the generous Holiday Bonus! I immediately went out and replaced our old TV with a HUGE flat screen. We are all enjoying the football games in style even though the Vikings let us down again! Maybe we will go to the Super Bowl next year. Danijela and I were thinking what would be the best thing to write and we decided to speak right from the heart. 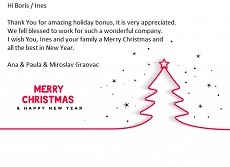 We wanted to thank you and Mrs. Ines for giving us acknowledgment with this Božićnica gesture and made Christmas extra special this year. We felt appreciated and motivated to be even better and we are very happy to be a part of EcoCortec and Cortec family. Have a Wonderful Christmas Season!!!!! Danijela and Tihana with families. Boris – Thank you so much for including me in the Excellence Award this year. I will forever be grateful for the opportunities, experiences and life Cortec has provided for me and my family. I am thankful to be a part of your company. 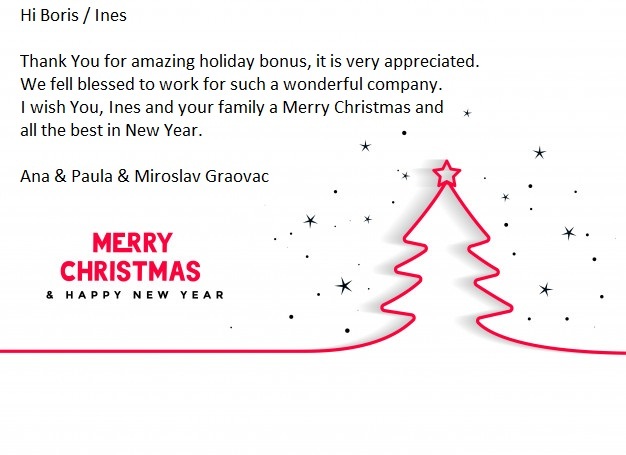 I wish you, Ines and your family a Merry Christmas. I just wanted to take a quick minute to let you know how much I appreciate the fantastic surprise I received today. It is always nice to be recognized and know your work is appreciated. This will definitely help my efforts in going to see my youngest in Arizona. I enjoy working with the Cortec family and look forward to all the wonderful things we can do together. Once again thank you and your generosity is appreciated more than words can say. We too truly enjoyed being together as "family". We thank you with our heart, because it is so special! Thank you for the Thanksgiving gift card that was handed out last week! As this season of gratitude approaches, I’m grateful for the opportunity I’ve had to work at Cortec for the last three years. I hope you and Ines have a Happy Thanksgiving, as well! The company and the food was excellent. Sarasota still amazes me with all the events and places to see. St Armand’s on Halloween will always be my favorite. Thank you Boris for the opportunity to be a part of it. I just wanted to send my sincere thank you for the trip I just took to Croatia and Italy. It was a delightful as well as a productive time, and again I am reminded how fortunate I am to work at Cortec. I am getting back in the groove here at CHQ now, but with many fond memories of your generosity and good will. Boris - you are extremely generous! Thank you so much once again!! Thank you so much Boris! What an honor to work for your company and feel appreciated for the work we do. Thank you! Good news indeed and a HUGE SURPRISE! Thank you so much for the recognition, but more importantly thank you for the support and resources you give me to make Safety happen at Cortec. I was requested by Boaz to send to you his warmest thanks for hosting him and for the time you and Boris spend with him. It is much appreciated. We do hope to have the possibility to welcome you in Israel and to show some of our Israeli hospitality. Again many thanks for providing Boaz memorable weekend. It was great to be in Zagreb and attend the Annual sales meeting. It was nice also seeing Boris again, especially on his birthday! I sensed that Boris will continue being mostly active for some more decades! Meeting also with your associates as well as with the rest of distributors of Europe/Mead East, will be proved useful as we can exchange information, leads and experiences and cooperate, when needed. Both Argiris and myself enjoyed also much the family spirit and the warm atmosphere during the dinner. We also enjoyed touring in Zagreb, which is very beautiful, very clean and very safe. It is actually a European capital where drivers respect the pedestrians –not frequent in Athens-, with beautiful gardens/parks, with exceptional aura and peace, where citizens enjoy their walks.The weather was great and we walked much. I think that I will be back again! We have ongoing projects and I trust that we will gradually grow enough, so we will qualify for some award in future. Many thanks for the presentations sent, which will nice promotional tools. Thank you for the congratulations and specifically the trust you and Cliff placed in me back in 2001 and again as GS was getting off the ground in 2013. Together we have all built something truly remarkable! My Cortec journey has truly been a blessing and I wouldn't trade a minute of it. Through Cortec I have seen the world, made lifelong friends and learned an incredible amount about industries and business. I have grown to appreciate life in new and exciting ways. All of us in Cortec Global Services Inc. will continue to work hard to fight the good battle and to put employees and customers first in all that we do -- just as you have done with us when we were under your care. Blessings into the new year Boris and to our continued mutual success going forward! Thank you so much for a wonderful week in Croatia. It was fun to be able to share in the celebration, and be in your hometown for the occasion. I’m sorry that I didn’t get to say goodbye on the way out of the plant today, and say a formal goodbye. Looking forward to see you again at the end of the month (after LASM), and thanks again for everything! Thanks a lot for your prompt and positive response!! It´s a privilege to count on you! Thank you Boris. I feel grateful being a part of your Cortec family!!! Take care. I was the happy winner of a $100 gift card at the CHQ employee appreciation lunch yesterday, and I wanted to say thanks for Cortec’s generosity and teambuilding efforts! I appreciate the many perks of working at Cortec—from birthday lunches and the personal trainer, to Cortec’s swallowing rising health insurance rate hikes the last two years. Many thanks to all involved in providing these benefits!! !